Jackie Stewart - Formula 1 World Champion on The Hornet comic. Homepage. 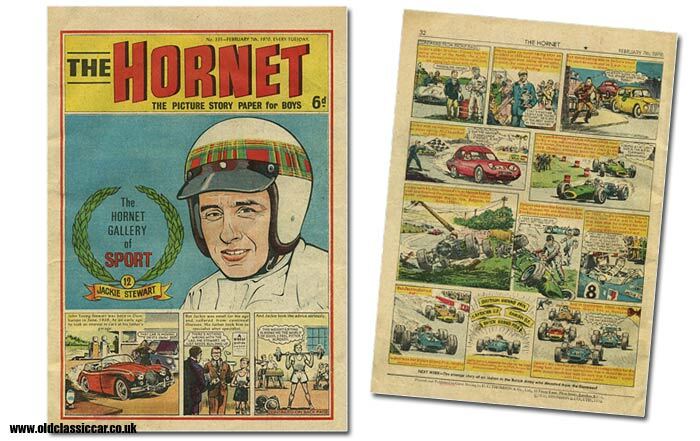 This page: The three-times F1 World Champion features on this copy of The Hornet comic from 1970. Generally I prefer the style of earlier children's comics, such as the pre-war Modern Boy or the slightly later issues of The Champion. This more recent issue of The Hornet though is interesting in that it features the story of Jackie Stewart, now Sir Jackie, from the early days helping out at his father's garage, through to his Formula 1 successes. The story opens with an illustration of a diminutive John Young Stewart (JYS), born in 1939, piloting an XK150 Jaguar around his father's garage forecourt. Jimmy, Jackie's elder brother, was already a name in the motor racing world, and a young JYS would often accompany him to races in the 1950's, meeting heros such as Fangio and Moss. But it wouldn't be in motorsport that JYS would first gain sporting success, that would in fact come via competing in clay pigeon shooting competitions. However the motor racing bug had bitten, and despite his brother having hung up his gloves for the final time, Jackie would sneak out and compete in cars such as a gullwing Marcos, entered under the pseudonym of A.N. Other so as not to upset his parents. Later he'd switch to racing E-Types and single seaters such as those produced by the Cooper team. His skills behind the wheel didn't go un-noticed and by the mid-1960s he was team-mate to Graham Hill at the BRM F1 team, winning his first Grand Prix at Monza. In 1968 he drove a Matra for Ken Tyrrell's team and narrowly missed out on that year's title. However in 1969 he'd achieve his ambition and won the Formula 1 World Championship behind the wheel of a Matra-Ford. In the years following the publication of this comic, he'd win the F1 World Championship in 1971 driving the Tyrrell 003, and again in 1973, the year of his retirement from driving in F1. Ever since, he has continued to be a presence in the world of motorsport, both in terms of striving to improve safety in the sport, and later as team principal of Stewart Grand Prix. This issue of the Hornet dates to February 7th 1970, and cost its eager reader (or his/her parent more likely) 6d. The Jackie Stewart story is the only item of motoring interest in this copy, the pages within featuring stories about cowboys, a boxer, daring wartime adventures, and a madcap scientist with his plans to save the earth from an imminent solar explosion. Whew! More items of paperwork relating to motoring and motoring-related businesses can be found in the Motoring Collectables section.